Made this with hemp milk and butter and thought it came out pretty tasty! Not as flaky as cornbread I'm used to, but very tasty and cake-like. Considering making it with different vegetable oils and milks. Would definitely buy again! Stone ground, whole grain cornmeal and sorghum impart an unmatched flavor and texture to this gluten-free cornbread mix. Super easy prep will yield light and moist cornbread. Enjoy with a homemade chili or full plate of barbecue. 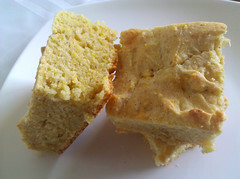 This gluten-free cornbread mix is specially made for those sensitive to wheat or gluten. Ingredients: 3½ cups gluten-free cornbread mix, 1½ cups milk (you may use rice, soy or dairy), ⅓ cup oil or melted butter, two eggs. Directions: All the ingredients should be at room temperature. Preheat oven to 375°F. Generously grease a 9 x 9-inch gray, nonstick pan. Place 3½ cups gluten-free cornbread mix in a large mixer bowl. Add 1½ cups milk, two large eggs and ⅓ cup canola oil or melted butter. Mix on low speed with electric mixer until blended. Beat another 30 seconds with mixer on high. Pour into baking pan. Bake 25 minutes or until nicely browned. **Please be advised that you will need to purchase more than one pound of mix in order to make the given recipe. There are approximately 2¾ cups per pound. We eat lots of cornbread. This makes my baking easier. Oh so good! Glad you offer this product. Thank you! I was preparing lunch when the post man delivered my Nuts.com order, so I decided to give the cornbread mix a try and made cornbread to go with our meal, the kids LOVED it!!!! Even my very picky 10 year old grandson!!!! It was easy to prepare and delicious! I can't wait to try the bread mix and the sweet dough mix I ordered. Thank you for speedy shipment. And date sample. I cannot wait to try cornbread mix and tomato powder. I just took the cornbread out of the over. We are having it for dinner. Can't wait to dig in, it smells so great. Baking the cinnamon bread tomorrow (no yeast). Thanks so much for including the recipes. It makes baking faster and easier. You'll have to make your own, ours will be gone in no time. Thanks for the great service. Whole grain cornmeal, potato starch, whole grain sorghum flour, evaporated cane juice, whole grain corn flour, tapioca flour, baking powder (sodium acid pyrophosphate, sodium bicarbonate, cornstarch, monocalcium phosphate), sea salt, xanthan gum. Packaged in the same facility as peanuts, tree nuts, soy, and milk products.